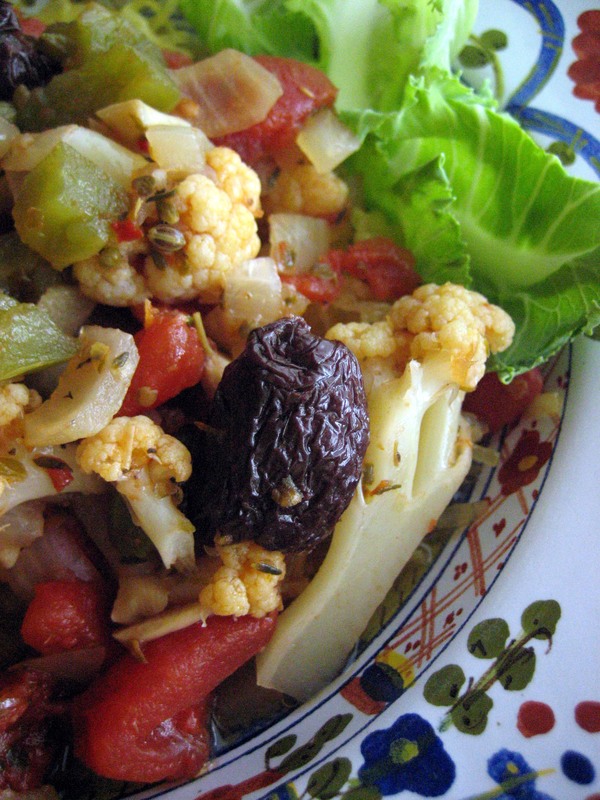 Cauliflower melds really well with briny Mediterranean foods like olives and capers. Making this chunky-style pasta topper is a great way to integrate another cruciferous vegetable into your diet. I like to serve it over olive oil-dressed spaghetti squash. Sauté the onions, bell pepper, garlic, oregano, thyme, fennel seeds and red pepper flakes over medium heat in a drizzle of olive oil until the vegetables have softened. Add the cauliflower florets, tomatoes, capers, olives, bay leaves and water. Bring to a simmer and cook until the cauliflower is tender and the water volume has reduced by at least half. Season with salt and pepper. Very nice! I love stewed vegetables like this. Spaghetti squash sounds like a great idea but I could eat it right out of the pot! on May 31, 2011 at 2:19 PM | Reply Tuesday Linkage!